Dhey Kyed Resort is 20 minutes drive from Paro International Airport located on a gentle slope overlooking the spectacular Paro valley. 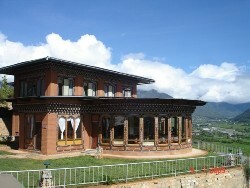 The design and painting of the resort will give a good display of the true aesthetic Bhutanese architecture. 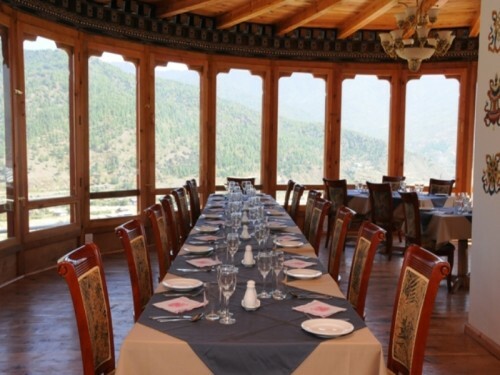 The resort offers fine dining with its selection of delicious Bhutanese, Indian, Chinese and continental cuisine at the beautifully located restaurant which also offers an incredible view of the meandering Pachhu Paro and the delightful paddy fields. The rooms are well furnished and equipped with necessary amenities like television, telephones, heating systems, comfortable mattresses and fine linen. 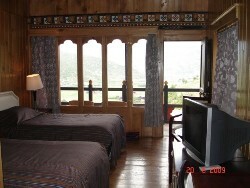 The toilets have 24 hours hot water supply, comfy tubs, showers and herbal toiletries exclusively made for the resort. The resort also offers a well equipped conference hall which can accommodate up to 50 participants. 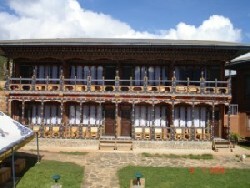 The hall can also be used as a dance hall for casual parties. The resort has international dialing facility, a good business centre with broad band service, foreign currency exchange, laundry and car rental services. 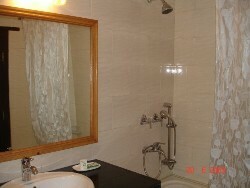 The guests can experience the traditional hot stone bath. Local herbs are added in the stone heated water to give medicinal value and fine aroma. Next to the hot stone bath is the massage room where experienced masseurs will soothe the aching body. Since the resort is situated at the base of a lush green pine forest dotted with ancient temples on the hills; it offers several excellent routes to its clients for nature walk or riding on local ponies.